‘Living Lab’ for Transit Innovation Opens in Santa Clara, Calif. The new initiative aims to rethink how VTA delivers bus, rail, roadway and other transportation services, said Santa Clara VTA GM Nuria Fernandez. As a catalyst for ingenuity, the center intends to pair itself with academics, startups, tech firms and nonprofits from the region. The center also will operate the VTA’s open data portal. Transit would be better served if the pay-per-ride and unlimited fare structures that currently dominate were expanded to include more fine-tuned pricing structures similar to those offered by cell phone companies. 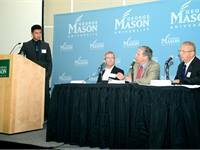 That was the idea that won the recent second annual Outside the Box transportation conference and competition at George Mason University’s School of Public Policy. The half-mile long Union Street Gondola will be able to move 1,800 people an hour and will be funded solely through private investment. Axonis is an elevated metro system able to transport from 15 to 45,000 passengers per hour per direction, while Urbalis Fluence is the first vehicle-centric communications-based train control system. The 98-foot-long bus has four guided axles, three of which can be controlled by means of a secure electro-hydraulic actuator system.